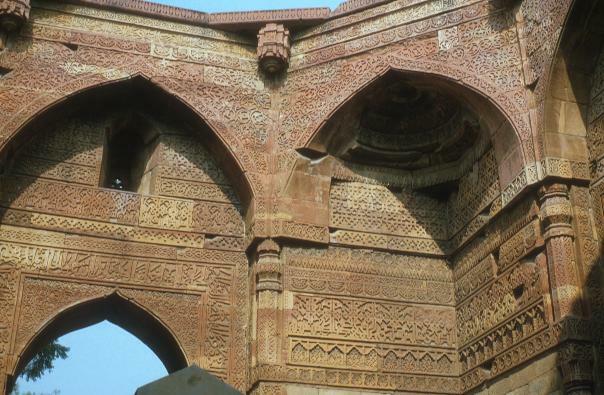 Built in A.D. 1235 just outside the Quwwat-ul-Islam mosque. A compact square structure of 42' side with entrances at three sides and western wall enclosed to accommodate 3 mihrabs. Exterior is relatively plain, but interior is richly decorated. A square hall of 30' side, its walls are relieved with white marble insertions. Quranic verses in Kufri, Tugra and Nashtalik characters with geometrical patterns interspersed. Most of the roof has collapsed, but remains show it to have been a shallow dome composed of concentric rings of masonry which collapsed due to excessive span. The most interesting feature is the first appearance in India of the 'Squinch'. This consists of projecting a small arch across the upper side of the corners of the square room, turning it into an octagon, then repeating the process to turn it into a 16 sided base in which a dome can rest. In this case, the squinch is a half-dome, though built on the corbelling principle. Thus, this is an Indianized version of the squinch.